The children at A&W Daycare, just east of the Warrendale neighborhood of Detroit, get their hands dirty harvesting tomatoes, kale, asparagus, cucumbers, pumpkins, squash and more in two onsite gardens – a hoophouse garden, and another outdoors. 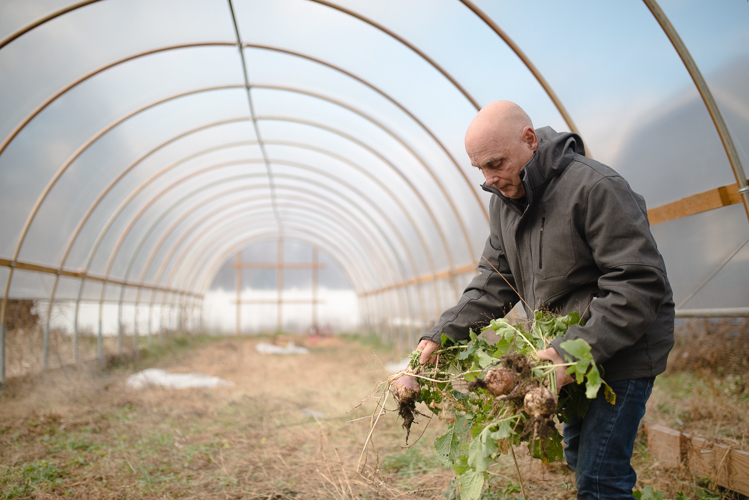 “We want the children to learn how things grow, and let them know everything we eat is growable,” says Al Macki, who has worked as the daycare’s handyman for 23 years, alongside his wife Ameera, the center’s owner. Hoophouses help extend growing seasons for early childhood centers. On any given day, you might see them seed, plant or water food later served for breakfast, lunch and snacks at the center. Impressive considering their ages: While some of the children attend the center’s five and under childcare program, others participate in Early Head Start (ages 0-3) and Great Start Readiness for 4-year-olds. Both programs, which help children from economically disadvantaged families prepare for grade school academics and beyond, have partnerships with the center. Time and income do affect food choices, according to the U.S. Department of Health and Human Services. “When incomes drop and family budgets shrink, food choices shift toward cheaper but more energy-dense foods,” notes an online report; healthier foods such as fruits, vegetables and high-quality proteins are often the first eliminated. “Time poverty presents an additional problem. 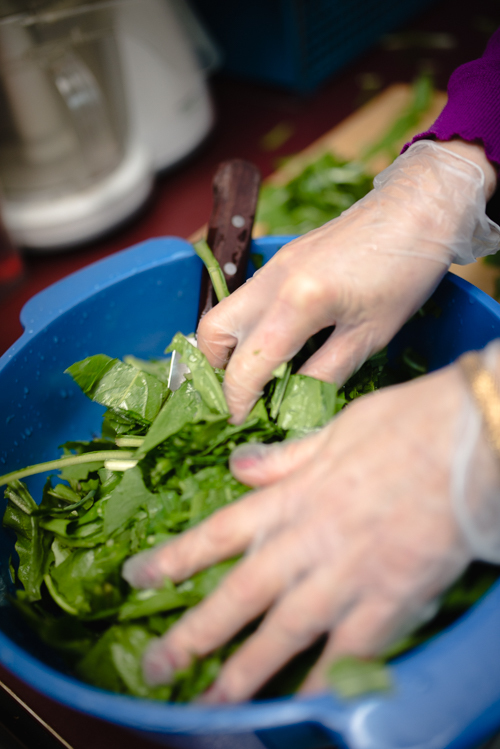 Decades ago, many American households included at least one person with sufficient time to shop for and prepare meals from scratch,” a lifestyle that’s often challenging for working and low-income parents, particularly single parents. But educating children and their parents about healthful foods is still achievable, the Mackis believe. And the hands-on approach seems to illustrate the possibilities, especially after the mini-gardeners reap the rewards, like stew the center’s full-time cook makes with meat, and vegetables from the garden. Keep Growing Detroit, a non-profit that encourages the growth of fruits and vegetables in the city, “told us everything we needed to know to get started,” Macki says, including tips on age-appropriate, food-related activities such as seasonal gardening tips and tasting activities. They were also alerted to the MI Farm to School Grant Program, administered by Michigan State University’s Center for Regional Food Systems. After applying, they received three different mini-grants for a three-year period: 2014-2017. One grant was used to purchase a commercial vacuum sealer to extend the life of the food. “After we seal the food, we put it in the freezer. It lasts all year ‘round.” The other two grants were used to purchase kitchen and gardening equipment. A&W Daycare's hoophouse was built with funds from a benefactor. 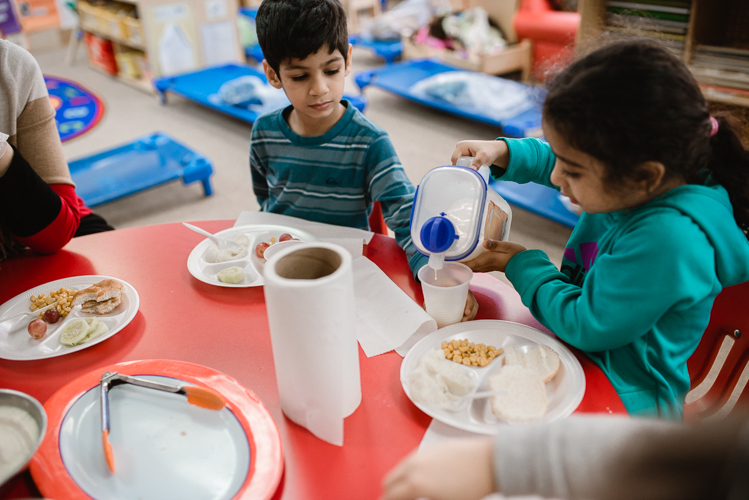 The children at Leelanau Children’s Center, which provides toddler and preschool programs in Leland, Michigan, also witness food “from beginning to end,” says the school’s program director, Molly Grosvenor. They might pick strawberries in the school’s garden, peel carrots to be served at lunch, or help out with compost buckets in the classroom. At A&W Daycare, parents are a very important part of the food program. The Mackis make sure to involve them with meetings, newsletters and visual examples around the classroom such as the tomato seeds sown in cups, which are easy to duplicate at home. “We say, ‘you can grow these in your house’,” Macki says. Meal time can be a special time for learning. And the kids? “While some are too young to understand, most of them love the idea and take pride in their [work],” achieving the program’s main goal, “a predisposition toward healthy eating,” Macki adds. 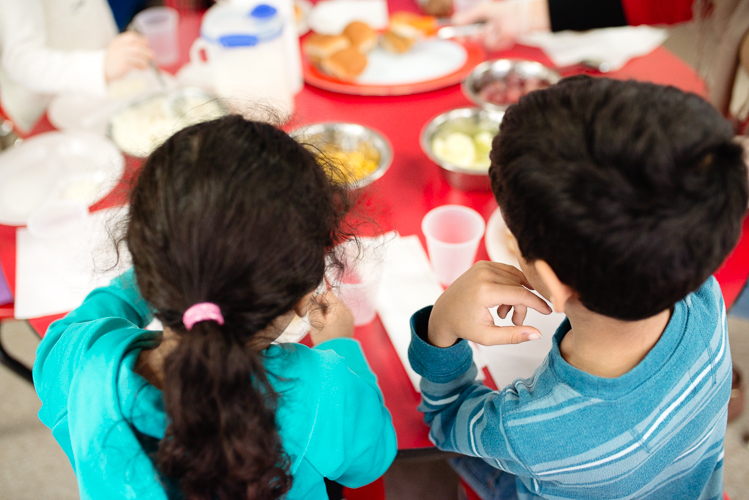 Hand-on learning helps children share with their families a love for good food.